Encouraging and Supporting Families to be their Child's FIRST & FOREVER Teacher!! The Communicating Partners Center is guided by one major belief: that parents are in the best position to make sure their child develops social and communicative skills to their potential. Most parents who come to me are convinced that only professionals can" fix" their child. This is an extremely dangerous belief because many parents virtually give away their child to professionals and avoid building just the intimate social relationships that only they can do. Parents and families inevitably influence their child’s development more than schools can. Consequently, professionals and parents need to collaborate more than they now do. WOW!! Those are some amazing statements and reassuring to dedicated parents who feel that they truly are their child's BEST teacher! There is a wealth of information on his website, Communicating Partners, and I would encourage you to check it out!! Another resource that I feel is outstanding in the area of speech and language development is Laura Mize's website, Teach Me to Talk. Laura Mize is a pediatric speech-language pathologist who specializes in treating young children, ages birth to three, with communication delays and disorders. What I love about Laura is her generosity in sharing her wealth of knowledge. She hosts a blog, weekly podcast, and series of video tips all for FREE. She also offers some videos, books, and manuals for purchase through her website. You will fall in love with her and her resources. She is truly a blessing by her gracious desire to share her knowledge and expertise for the benefit of others. Meet Laura below in her video on using BUBBLES for a speech activity. Enjoy! I hope these two resources will be an encouragement to you as you homeschool your child with special needs! Disclaimer: I was given, "Faithful to All His Promises" Classroom Kit (Electronic Version) for review. I was not required to write a positive review and all opinions are my own! I was recently given the opportunity to review: Faithful to All His Promises (REVISED Version) from Children Desiring God Ministries. "Faithful to All His Promises is a study for children on the promises of God. Children will not simply learn about some of God's promises, but rather, they will discover what it means to trust in those promises which are God's gift to us, not something we deserve. Faithful to All His Promises begins by teaching children what a promise is, what makes God trustworthy with these promises, and who these promises are for. Then children get to explore some specific promises from God to see how He has been and will be faithful to each of those promises." "Faithful to All His Promises" consists of 40 lessons (to view the curriculum's complete scope and sequence click HERE). Of the 40 lessons there are 25 specific promises taught, such as: God Will be With You, God Hears Your Prayers, and God Will Provide for Your Needs. This curriculum was specifically designed to use in the church. Children Desiring God Ministry has considered that families may want to use this in their home. Therefore, they have included helpful hints such as ways to adapt the curriculum for home, the advantages of using the material in your home, and scheduling recommendations in the Teacher's Guide Appendix. I found these suggestions helpful! As I began looking through the Teacher's Guide I thought it would be best to purchase the student workbook (only $5 automatic download!). The workbook includes two pages per lesson. The first page contains the lesson number, main ideas, scripture, memory verse, and activity instructions. The second page is the correlating activity page that the student completes. Take a look at the student workbook example HERE (see page 21-22). In our home we complete one lesson per week. Each week my children are excited to discover a NEW promise! To make it an enjoyable experience I've placed each week's new promise, written on paper, inside a small treasure box. My young children love to open the box each week to reveal the special promise! We then turn to scripture and read the correlating bible verse. I desire for my children to understand that, "mama didn't make up these promises, they have been given to us BY God found IN the bible!" After, we tape the small promise paper to a large poster board to reflect upon and review in the weeks to come! We then sing the hymn, "Standing on the Promises of God" as a song we are putting to memory that correlates beautifully with this curriculum!! (See the first two verses below! I have thoroughly enjoyed EACH lesson! 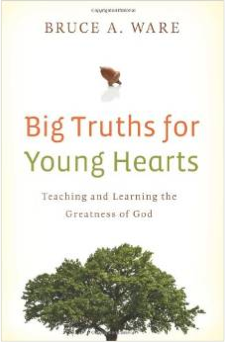 It is a blessing to me to have a rich theologically, God-centered curriculum for my children at such a young age. The promises presented are like bullets my children will have loaded and will be able to fire off under life's twist and turns. Not only are my children learning but EVEN I have been blessed by this curriculum and have been thankful to go through it together as a family. Each promises is like a solid brick we can build upon and STAND! I highly recommend considering going through this curriculum as a family! Although this study is intended for second grade age level I feel it is good for ALL AGES! Learning and memorizing the promises of God has no age limit! This study can be easily used for the entire family AND be repeated! I foresee my family going through this study again! The curriculum can simply be used as a guide for the study of God's promises. Many times we like to have our children DO workbooks, journals, or activities. Using this simply as a guide for reading scripture and discussing the main ideas is a wonderful simplified way to incorporate this into your family's routine, family devotions, or bible home school lessons. THERE IS MORE! Once you complete this study, Children Desiring God Ministries has an entire scope and sequence with more studies to work through! Check it out HERE! I strongly encourage ALL parents to teach the bible at home, not just homeschooling families. Children Desiring God Ministries supports this as well and gives us a biblical reference in Deuteronomy 6:5-9 for reflection in this area. In the curriculum they state, "The primary responsibility and privilege of nurturing the faith of youth rests on parents." What a joy it is to act upon this God given responsibility and teach my children Christ! I feel confident in partnering with Children Desiring God Ministries and their resources to help me teach and train my children in the Lord. "Our mission is to spread a passion for the supremacy of God in all things so that the next generation may know and cherish Jesus Christ as the only One who saves and satisfies the desires of the heart. We want millions in every generation to set their hope in God. To that end, we aim to fuel spiritual desire by producing God-centered, Bible-saturated, Christ-exalting resources and by equipping parents and churches working in partnership to instruct the mind, engage the heart, and nurture the faith of the next generations." Thank you Children Desiring God Ministries for allowing me the time to review this curriculum and share my thoughts with my readers! Thank you to my readers for taking the time to visit "My Teacher's Name is Mama" and consider, "Faithful to All His Promises" for your family! God Bless you!!! Happy New Year!!! My Teacher's Name is Mama has been on recess since October of 2015!!!! I'm looking forward to reconnecting with you and sharing once again some ideas, tips, and encouragement for your family as you teach your child!!! Theology Thursdays FOR KIDS!!! 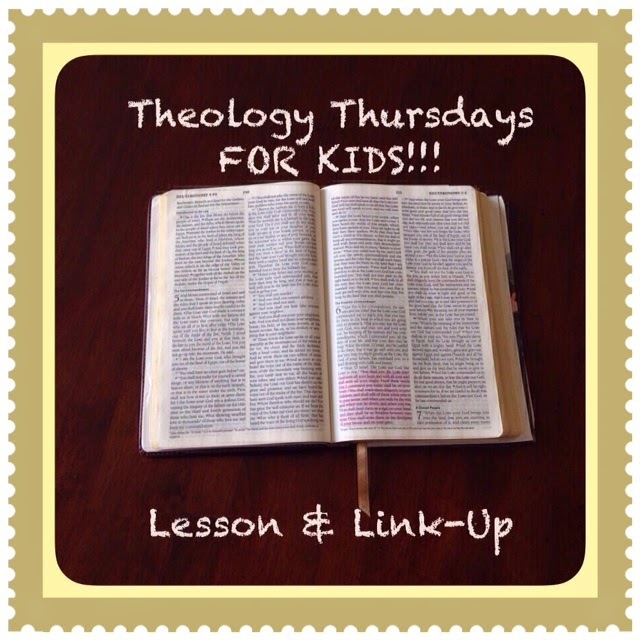 Lesson & Link-Up #23 What is Sin? Welcome back to, "Theology Thursdays FOR KIDS!!" Don't forget at the end of the post you are invited to Link-Up! If you missed the introduction post please click HERE! This will give you all the information about this series! Theology Thursdays post will now be on the FIRST THURSDAY of every month! Current guidebook for the series. I really enjoyed this chapter by Dr. Ware. Sin is something we explain to our child at an early age. In fact, my four year old daughter just memorized, "All have sinned." Rom. 3:23 for her Wednesday night church program. We may begin explaining sin as "the bad things we do" but if we want to go deeper Dr. Ware provides great instruction! "Sin always works by tricking us, or deceiving us, into doubting things that are true and believing things that are false." "Sin is lived out through turning from God and his ways in order to do what WE think is best." "Sin always results in harm, ruin, and death." Don't be afraid to challenge your child to THINK! In a world where children have many thoughtless and effortless tasks (video games, TV, and computer time) challenge your child to THINK through great truths of the gospel! Take your time to soak up truth! Don't rush through a lesson, allow time, opportunities, and study to help resonate a specific truth within them (and us!!). Begin an individual journal or family journal about the theological truths learned, review it regularly. Pray that the Lord would give you wisdom and understanding as you seek to honor Him in the teaching and training of your children. Pray that God would open the eyes of your child's HEART that they would EMBRACE the gospel not just KNOW the content intellectually (see this related post). Talk about these truths DAILY and when teachable moments present themselves take advantage of them! Debbie from "Blogger Loves the King" shares her observations, application, and prayer from Proverbs 13:14! It's your turn to LINK-UP! Please see the rules below! Please link up any related post on biblical theology, teaching God's Word to Children, or even a general biblical post for encouragement! I would appreciate if you link back to my blog in some way! Then don't forget to come back and visit other bloggers who linked-up too! *I reserve the right to remove any post that I feel may not be appropriate or applicable to this particular link-up. Thank you for reviewing and following the link-up rules! Was your blog featured? Grab this button below to display on your blog! Thank you for your participation! Labels: Theology Thursdays FOR KIDS!!! 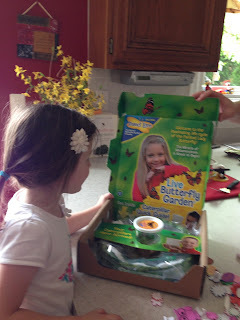 What REALLY got us started with a love for butterflies this year was a simple caterpillar kit we ordered online (see my affiliate link below for further details). The kit came with wonderful instructions, five live caterpillars, and a large butterfly house/net. 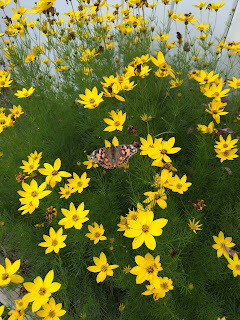 IF you are approaching cooler weather where you live you may want to save this activity for spring OR complete now but consider releasing the butterflies at a local indoor butterfly garden! We had SO MUCH fun watching the life-cycle unfold before our eyes! After we released our butterflies we started to make our own back yard garden. My husband cut out a small rectangular place in our yard, bordered it with wood planks, and filled it with loose soil. 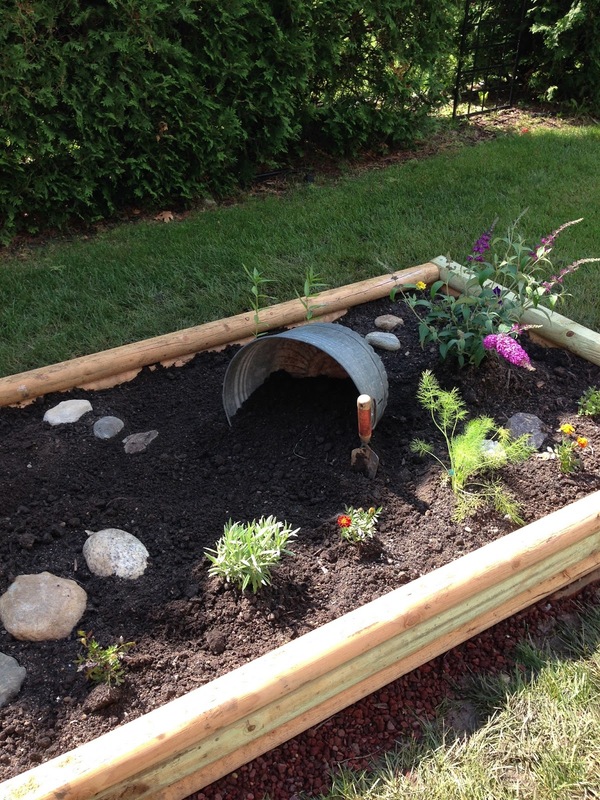 Next, we added two types of plants...HOST plants and NECTAR plants. Host plants are the plants that butterflies lay their eggs on. For example a monarch butterfly will lay her eggs on a milkweed plant SO milkweed would be considered the host plant. Different butterflies prefer different types of host plants! The best way to know what type of host plants to plant in your garden is to see what type of butterflies are in your local area. 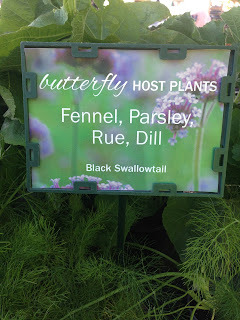 Then pick out host plants that those butterflies will lay their eggs on. Not sure what type of butterflies you have in your yard? Visit a local nursery or science center and ask!! 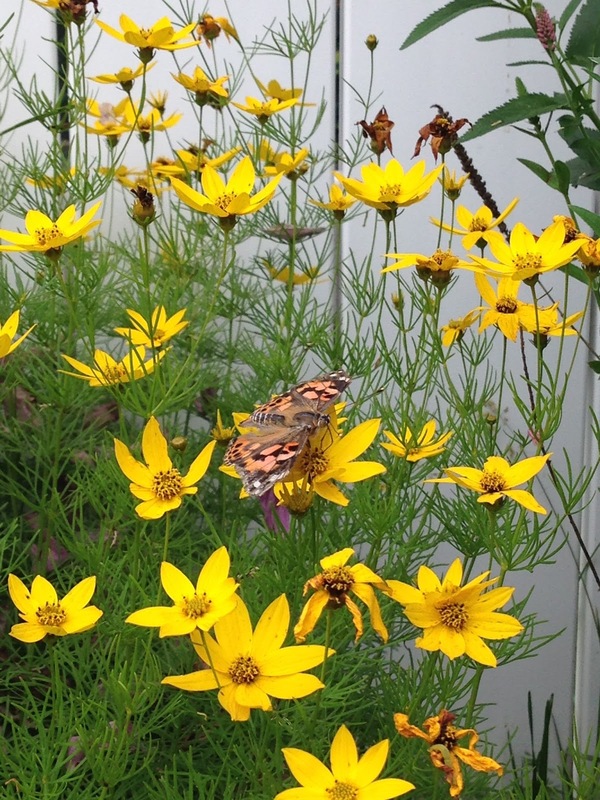 The butterflies can smell the host plant many miles away and will come to your garden to lay their eggs! 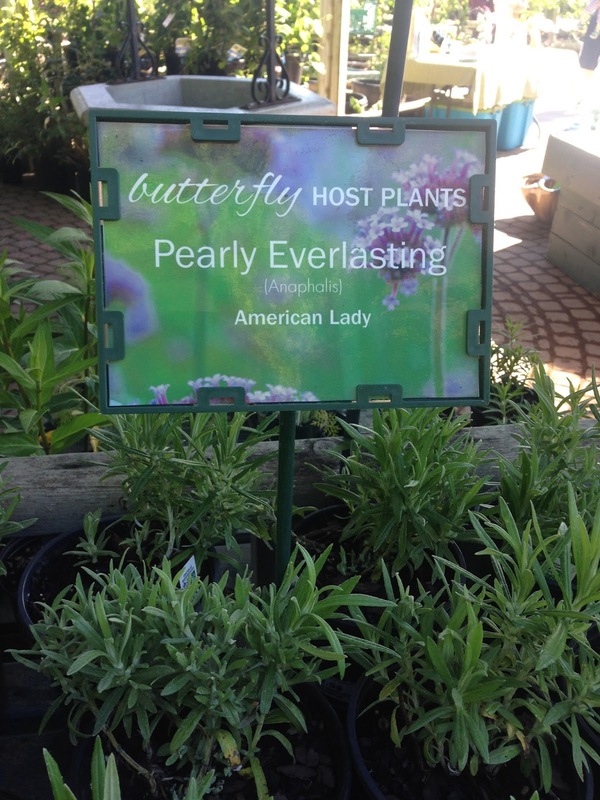 We are fortunate to live close to a wonderful nursery that actually encourages you to plant butterfly gardens. 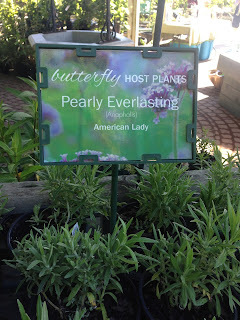 They have many types of host plants available for purchase. Pictured above are the plant labels of what butterflies they will attract. 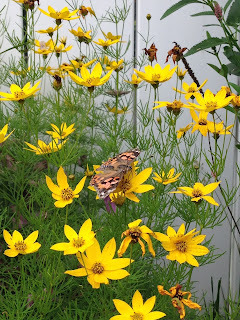 Next (the easy part), plant nectar plants for your butterflies to feed on! Some nectar plants butterflies really enjoy so carefully read your plant labels to see if they will attract butterflies! Try to plant a variety of colors and flowers that bloom throughout the season! Now watch & wait to see your new winged friends visit your garden! Welcome back to, "Theology Thursdays FOR KIDS!!" Don't forget at the end of the post you are invited to Link-Up! If you missed the introduction post please click HERE! This will give you all the information about this series! 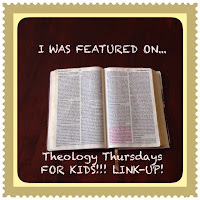 Theology Thursdays post will now be on the FIRST THURSDAY of each month! Last month we dove into what it means to be made in the image of God! This month we will continue to work through biblical facts of being human! Dr. Ware shares with us four additional aspects of our human nature. "We are creatures, and God is the creator." This first point will help you explain to your child that creation points to a beautiful, special creator God. God has allowed us to know this through the bible and through observing creation. The human body alone is such a wonderful masterpiece designed and formed by God! In response we humbly submit ourselves to our God! "God has given us the ability to know the difference between right and wrong." The second point allows us to teach our children that we have a moral nature unlike God's other created things (like animals). "All that God created was good (Gen1:31)." This means that our bodies and souls were part of God's good creation. God invented the human body...God was kind with how he made our bodies...he gave us taste buds that make our food enjoyable...eyes to enjoy seeing, and so forth!! "God made human beings male and female." This point may also be a good way to discuss the different God-ordained roles that men and women have (both equal before God yet both have different roles). I would like to direct you to the web-site Desiring God. It has many FREE resources for you to use as you seek to train your own mind and heart biblically! Click HERE for a good resource that goes along with point #4! Jump on over to Darling Downs Diaries to find out why she said, "I would rather be tired of these things than never have experienced them." Dr. Ware shares two main ideas that help us understand what it means that we are made in God's image. Before he presents theses ideas he addresses that both men and women are equally made in the image of God (Genesis 1:26-28), humans have a calling to rule or have dominion, and Jesus helped us understand what it means to be the image of God as he lived his life and showed dominion over creation (Colossians 1:15-17). Dr. Ware's shares, "The main way we are made like God is through the qualities that he has put within us." We are to be holy, loving, forgiving, truthful, faithful as God is. Yet sin came into the world and we are not this way therefore we need to be REMADE into the image of God once again. Because of what Christ has done for us through his life, death, and resurrection we can trust Christ for our forgiveness of sin. We then can begin the process of being remade into the image of God, as we are made like Christ (Colossians 3:8-11, Colossians 1:15, John 1:14). Looking to dive deeper in your understanding of what it means to be made in the image of God? John Piper from Desiring God has a wonderful 5 minute explanation to help us deepen our understanding of this amazing truth! Click HERE to listen! 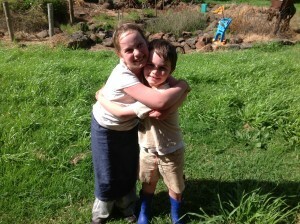 Thank you to my faithful blogger from Darling Downs Diaries who shared a post titled, "We are all the Same." Hosanna! "Hooray Salvation is Here!!" Personalize your Child's Alphabet Books! Find "My Teacher's Name is Mama" on Social Media Below! Host yout own link-up! Click below for more details! Visit my friend Amy's GREAT copywork below! Some of the links on my site are affiliate links, meaning that I could potentially make a small amount of money if you purchase something from that link. It is my desire to encourage and support you to be your child's FIRST & FOREVER teacher. The affiliate links provide a way for me to suggest products to you as you teach your child! It is my desire to only suggest products that I feel will be helpful for you and your family. Currently I am an affiliate for amazon.com. 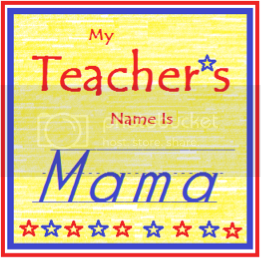 ©2014 My Teacher's Name is Mama LLC. Simple theme. Powered by Blogger.